When RIO ceased being an organisation its name moved into the 5uu's (USA), Guapo (UK), Miriodor (Canada), and Thinking Plague (USA). The term "RIO" today is almost synonymous with avant-rock or experimental rock. A "reunion" festival took place at the Maison de la Musique de Cap Découverte in Guapo, NeBeLNeST, Salle Gaveau and GMEA. Two RIO festivals took place in 2014, the seventh French event in Carmaux in September, and a Japanese edition of the festival in Picchio dal Pozzo (Italy), Richard Pinhas (France), Present (Belgium), Le Silo (Japan), SOLA / Lars Holmer's Global Home Project (Sweden/Japan). Cutler, who features in The Artaud Beats, said of RIO Japan: "[RIO] is changed of course; back then it was a musician-led exercise in self-sufficiency fighting for new musical forms and independence from the institutions; now it is recast as a celebration of those times and those bands, and of the music they inspired. [...] Which, I suppose, is the way it should be. RIO ceased to be ours long ago; now it's yours. Take care with it." ^ The text of the ticket below the flyer varies depending on source of the picture. On the Stormy Six homepage it clearly says "FIVE ROCK GROUPS THE RECORD COMPANIES DON'T WANT YOU TO HEAR. ", whereas at SquidCo the ticket is not legible and a bubble (incorrectly?) says "THE ROCK SHOWS THE RECORD COMPANIES DON'T WANT YOU TO HEAR." ^ Zampino, Phil. 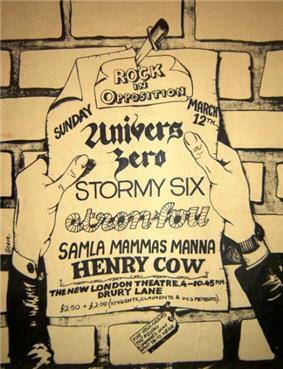 "Rock in Opposition". SquidCo. Retrieved 12 September 2007. ^ a b c Cutler, Chris. "Rock in Opposition". Chris Cutler homepage. Retrieved 31 August 2007. ^ Dorsch, Jim. "5uu's". AllMusic. Retrieved 25 October 2011. ^ Mason, Stewart. "Aethenor". AllMusic. Retrieved 25 October 2011. ^ Lynch, Dave. "Miriodor". AllMusic. Retrieved 25 October 2011. ^ Couture, François. "A Thinking Plague". AllMusic. Retrieved 25 October 2011. ^ "Avant-Prog". AllMusic. Retrieved 25 October 2011. ^ a b "Rock in Opposition Festival 2009". ^ "Interview with Roger Trigaux". Romantic Warriors II: Special Features DVD. Washington, D.C.: Zeitgeist Media (2013). ^ "Rock In Opposition France Event – April 13th, 14th & 15th 2007". Rock Time. Archived from the original on 12 December 2007. Retrieved 7 March 2010. ^ "Rock In Opposition 2010 – France Event". Progression Magazine. Retrieved 1 August 2013. ^ "Rock in Opposition Festival 2011". Avant Music News. Retrieved 1 August 2013. ^ a b Lynch, Dave. "Romantic Warriors II: A Progressive Music Saga About Rock in Opposition". AllMusic. Retrieved 14 December 2012. 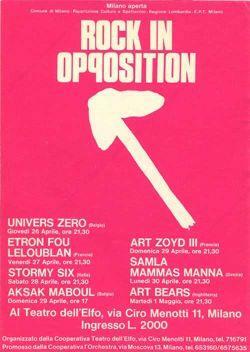 ^ "Rock In Opposition – 19/20/21 Sept 2014". Rock Time. Archived from the original on 8 September 2014. Retrieved 8 September 2014. ^ a b "RIO Japan 2014". rockinopposition-japan.com. Archived from the original on 8 September 2014. Retrieved 14 August 2014. ^ "Chris Cutler's Message". rockinopposition-japan.com. Archived from the original on 8 September 2014. Retrieved 14 August 2014.